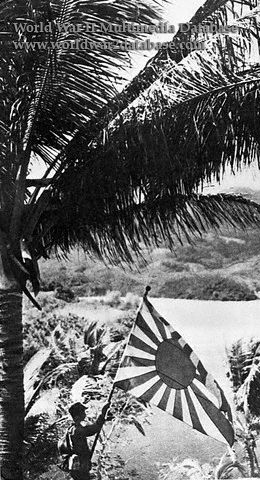 Propaganda photo of a naval infantryman displaying the Imperial Japanese Navy ensign in Zamboanga, Mindanao, Philippines, around March 3, 1942. This photo appeared in "Weekly Photos" Number 213 on March 25, 1942. "Weekly Photos" published many wartime photos for the Japanese public. The flag was probably taken from the cruiser IJN Kuma. On March 3, 1942, 150 men of the 32nd Base Force landed on the Zamboanga beach about half a mile (one kilometer) from the city. The landing force was commanded by a Lieutenant Yamada and accompanied by a light tank and armored cars landed from the transports Keiko Maru and Busho Maru. A second unit from IJN Kuma, 70 men, rescued Japanese nationals incarcerated by the Allies at Ayala. Kuma was accompanied by a torpedo boat, IJN Kiji, and a subchaser, Kyo Maru Number 13. The invasion force was covered by seven reconnaissance seaplanes from the 32nd Air Group. Vice Admiral Rokuzo Sugiyama (Janaury 4, 1890-June 6, 1947) was in overall command of the 3rd Sourthern Expeditionary Fleet while Naosaburo Irifune (February 27, 1891-December 24, 1953) commanded the 32nd Base Force. The Filipino-American garrison at Zamboanga was under the command of Lieutenant Colonel Albert T. Wilson Sr. (March 3, 1890-November 11, 1970). The forces around Zamboanga consisted of the 1st Battalion, 102nd Infantry Regiment and two companies of the 43rd Regiment, Philippine Scouts, among other units. Wilson had only assumed command in February 1942. The Japanese occupied Zamboanga City within a few hours and by March 6 Wilson retreated into the interior of Mindanao to fight a guerilla action. Wilson surrendered his forces on May 14, 1942. Zamboanga was liberated on March 11, 1945, but fighting on the Zamboanga peninsula continued until the end of the war. Colonel Wilson Sr. remained in captivity until his sons, Lieutenant Colonel Albert T. Wilson Jr. (April 19, 1911-March 1, 1970) Communications Officer for the XXI Bomber Command, 20th Air Force, and Willard W. Wilson (July 23, 1915-March 14, 1997) commander of the 355th Bombardment Squadron, sent a Boeing B-29B Superfortress "Salome" to the Hoten prisoner of War camp in Mukden, China. The Wilson brothers renamed the plane "Dode" and had a large pipe painted on the plane; that was their father's trademark. The family was reunited in Kunming. Colonel Wilson, Sr. had not seen his sons since 1939. The Wilson brothers went on to fight in the Korean War. Lieutenant Colonel Albert T. Wilson Sr.